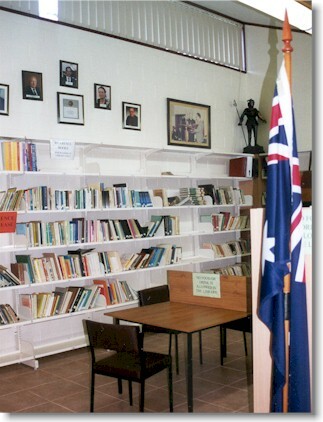 The MCCV Library at the Maltese Centre in Parkville was recently refurbished with funds kindly donated to the MCCV by the Newport Maltese Association. The MCCV President, Mr Victor Borg, officially re-opened the library in October 2001 and Mgr Joseph Grech, Bishop of Sandhurst, blessed it. The re-fitting included new shelving, floor tiling, blinds, light fittings, glass book cases, table, chairs and desk. Originally opened in early 1985, the library houses about a thousand books and is considered to be one of the largest collections of Maltese publications in the southern hemisphere. Except for rare books and reference books, all books and tapes may be borrowed. To borrow books one needs to obtain a membership card, which serves as Proof of Identity. A borrower must produce a valid Driver's Licence, or similar proof of identity, to obtain a membership card. Books may be borrowed for a period of 4 weeks. Where an extension is required, one may obtain an extension by phoning the Maltese Centre. If the books are not returned on time, a fine is imposed on the borrower for the late return. As at the end of January 2002, the library has a total of 50 members and about 200 books have been borrowed. The MCCV library is open on Thursdays, from 10.00 am till 12.00 noon, and Fridays, from 6.00 pm till 9.00 pm, or by appointment. The contact phone number is 9387 8922. The MCCV Vice-President, Mr Guy Deguara, and Public Relations Officer, Charles Belli, run the library. Books on Wheels: The MCCV is looking for volunteers to distribute books, videos and other reading material to our elderly people who are unable to travel to the Library at Parkville. Those interested may contact the Centre on 9387 8922 during office hours and leave a message for Charles Belli, or E-Mail to Charles@charbell.com. Other books of Reference which are too numerous to list them all here.